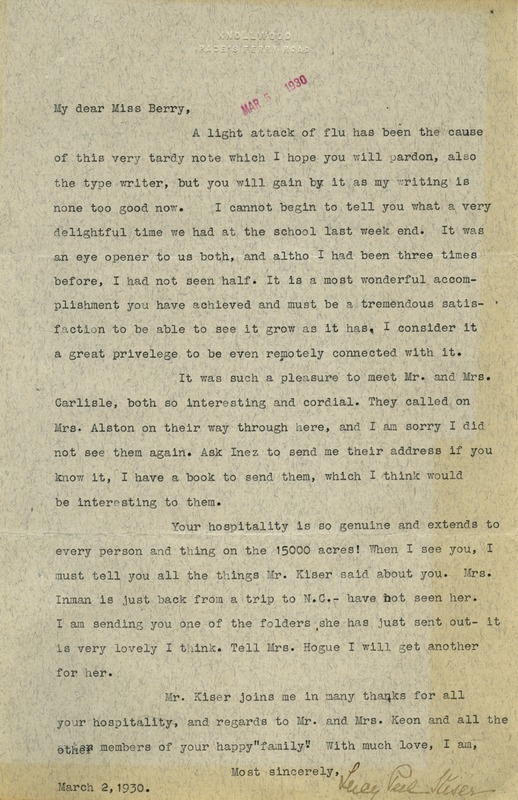 Lucy Peel Kiser writes to Martha Berry to express how interesting she found her trip to the Berry Schools. Lucy Peel Kiser, “Letter from Lucy Peel Kiser to Martha Berry.” Martha Berry Digital Archive. Eds. Schlitz, Stephanie A., Christy Snider, et al. Mount Berry: Berry College, 2013. accessed April 18, 2019, https://mbda.berry.edu/items/show/13098.